The Infinix S2 Pro, also known as Infinix X522 is the latest addition to the Infinix Mobility’s portfolio of products. The X522 is an upgrade to the first ever Infinix smartphone to spot a fingerprint scanner, Infinix HOT S and this time, they are dropping the HOT branding from the S range. 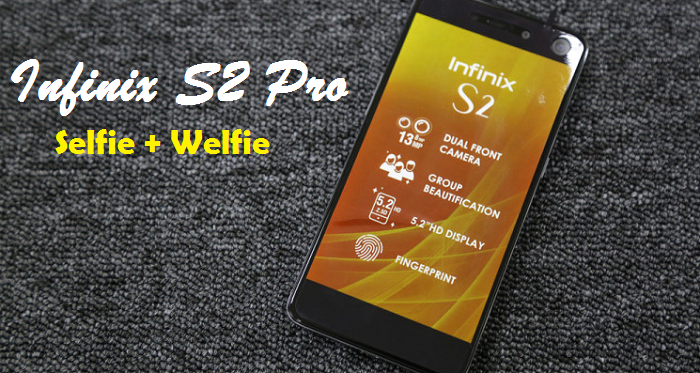 The Infinix S2 Pro selling point is on the dual-front camera to allow users maximize their everyday photography experience. Not just selfies, but selfies with the crew – Wefie. This was why it was announced with the theme ‘selfie‘ plus ‘wefie‘. It is clear that the Infinix S2 Pro android phone is Infinix mobility’s answer to Tecno’s latest releases – Tecno Camon CX and the Tecno Camon CX Air – Both cameras focused with a 13MP camera on the rear and front, specifically designed for selfie lovers. Infinix S2 Pro features a sleek design with a 5.2-inch IPS display with 720 x 1280 pixels resolution. This may not be as good as the 1080 x 1920 pixels of its predecessor, but at 282 ppi is still near Retina Display range. The device body had its curvature redesigned to fit into a 2.5D Dragontrail glass. As per the camera, Infinix S2 Pro has a 13 megapixels camera combined with a wide angle 8 megapixels camera in the front. The wide-angle camera offers a 130° wide-angle lens that makes it possible to pack more people into a selfie shot (Wide selfies). Infinix S2 Pro runs Android 6.0 (Marshmallow) on a MediaTek MT6753 chipset with 3GB RAM and 32GB built-in storage provided. The chipset offers eight cores that can be clocked at up to 1.3GHz. If you need more storage space, you can add up to 128GB via a microSD memory card. Infinix S2 Pro offers Bluetooth 4.0, microUSB 2.0, Wi-Fi, and rear-facing fingerprint sensor. The Android phone supports 4G LTE, though at this point we can not confirm LTE bands. Infinix S2 Pro is now available in Kenya, but is yet to launch in Nigeria and Ghana. Once available, you can buy the Android phone at leading online stores in the countries. Infinix S2 Pro price in Nigeria is expected to range from 45,000 Naira to 75,000 Naira, depending on your location. The Infinix S2 Pro Price in Kenya starts at around 15,699 KSh. We will update this specsheet once we have more data.